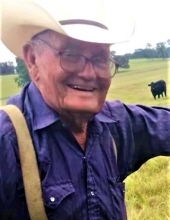 Curtis Easterling, age 92, was born near Leona, TX on October 21, 1926. He went home to rest from a lifetime of labor and service on April 14, 2019. He was the son of Arthur McIver Easterling, Sr., and Lavinia Ola Ward Easterling. Curtis graduated from Leona High School and served in the Merchant Marines. He married the love of his life, Bonnie Cooper Easterling, and they worked and lived together for more than seventy years. Curtis was a rancher and a steward of the land. He raised cattle his entire adult life; he loved taking care of his pastures and spending time on his beloved bulldozer. Curtis was friendly and outgoing and loved to visit with family and friends, including many with whom he shared morning coffee on a daily basis. He was a lifelong member of the Evans Chapel United Methodist Church. He also served as a Leon County Commissioner for sixteen years. Curtis was preceded in death by his parents; brothers William Alfred, Ray, Martel, Junior and a sister, Geraldine Harms; and also by his grandson Wade Wilson. He is survived by his wife, Bonnie; son, John Nelson Easterling of Indian Trail, NC; son, Ward Easterling and wife, Cindy of the Evans Chapel Community, TX; daughter, Lou Ellen Hassold and husband, Tommy, also of Evans Chapel. He is also survived by grandchildren, Chrisinda Hinson, Teri Easterling, Amy Smith, Lisa Brooks, Chad Wilson, Alex Wilson, Layne Wilson, Curtis Wilson, and Lauren Hassold; fourteen great-grandchildren and one great-great grandchild. A visitation will be held at Walters Funeral Home in Centerville, TX on Monday April 15th at 6:00 pm. Graveside funeral services will be held on Tuesday, April 16th at 10:00 am at the Evans Chapel Cemetery. The Rev. Dr. Jerry House and Rev. John Burchell will officiate. Pallbearers will be Chad Wilson, Alex Wilson, Curtis Wilson, Buddy Ruffeno, Ronnie Miller, and Doug Hassler. Honorary pallbearers are Edwin Reed, Royce Keeling, Ron Miller, Frank Gilbert, Jr., Larry Watson, and Gary John Cooper. In lieu of flowers, the family requests that donations be made to the Evans Chapel Cemetery Association, 8167 County Road 410, Normangee, TX 77871. To send flowers or a remembrance gift to the family of Curtis Easterling, please visit our Tribute Store. "Email Address" would like to share the life celebration of Curtis Easterling. Click on the "link" to go to share a favorite memory or leave a condolence message for the family.